College Square North formed one side of the original Georgian College Square dating from the 1830s and centred on what is now the Royal Belfast Academical Institute. The area retains good examples of vigorous and robust architectural detailing particularly of Neo-Classical style that give a rare glimpse into Georgian Belfast. Once the fashionable address for the wealthy professionals and merchants of Belfast, the square has suffered the ravages of time and history, and the indignity of being somewhat overwhelmed by the later construction of the Belfast College of Technology (now John Bell House), but still has a lot to be admired. College Square North survived the heavy bombardment of Belfast’s city centre during the 1941 Blitz, and the descent into semi dereliction after the Second World War. Further to this, it was significantly damaged during the 1970s from bombing and subsequent demolition that led the area to become known as ‘bomb alley’. Numbers 1-4 and 8 were demolished by the bombing while the building at No. 8 is a replica reconstructed by Hearth Housing Association. Nearly all buildings on College Square North have been deemed at risk in recent times, however currently Wilton House, The Old Museum Building and No. 12 are on the Built Heritage at Risk register illustrating the changing dynamics of a city and the movement of people. The current single building where Wilton House stands was originally constructed as two separate dwellings in 1822-1832/33, and is believed to be the work of Thomas Jackson, now grade B2 listed. The buildings were combined in 1894 and converted into the ‘Hotel Metropole’ and from 1907 the building was used as a mission hall for the ‘Adult Deaf and Dub Organisation’. 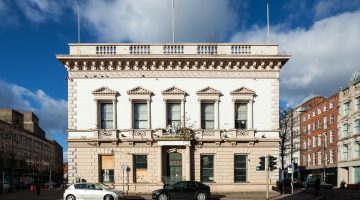 A four-storey seven-bay stucco terraced building is of note due to its scale and historic change as representing the development of this part of Belfast in the early 19th century. Although the building has been for sale, and subsequently sold in recent years the building remains vacant, overgrown and rather forlorn in such prominent site in the city centre. Next door, the Old Museum Building is set back from the street. 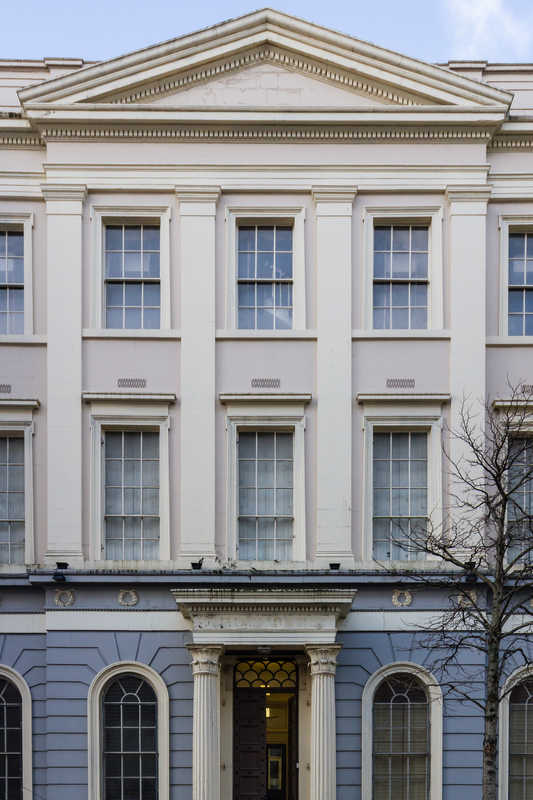 The three-storey, five bay Greek Revival built 1831 remains relatively unaltered in 180 years despite repeated attacks during the Troubles. Speaking with Professor Brian Walker, Treasurer of the Belfast Natural History and Philosophical Society he says “Number 7, College Square North, now known as the Old Museum Building, was erected 1830-1 by our society, The Belfast Natural History and Philosophical Society, founded ten years earlier. Both building and society are still going strong today and our society holds monthly lectures in the building. Designed by Thomas Jackson, the building has been described by Paul Larmour as ‘a scholarly piece of Greek Revivalism with details compiled from various Athenian sources’. Our society ran it as a museum until the early 1910s when we handed over our collections to the Belfast Municipal Museum, later the Ulster Museum. From that time the building has been let out to various cultural and arts bodies. At present it is also home to the office of Ulster Architectural Heritage and the ‘Kids in Control’ theatre and dance group. 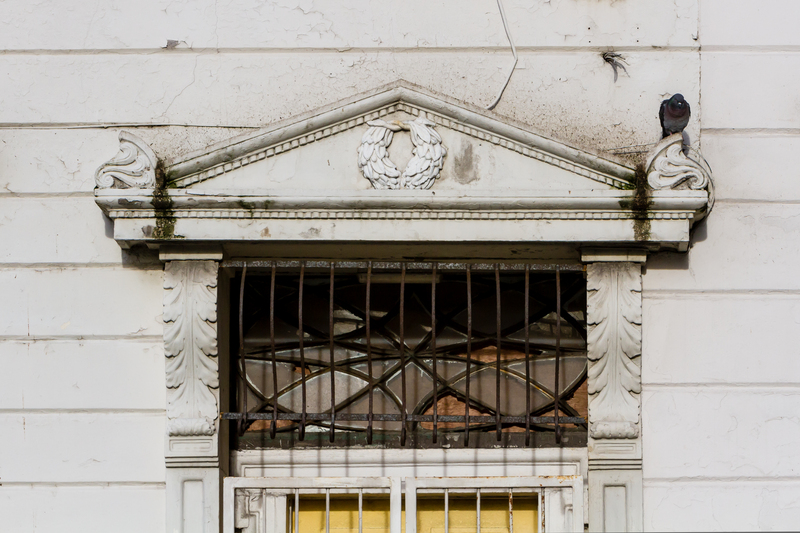 Today, the Old Museum Building is in need of restoration and modernisation. Lack of disabled access is a particular problem. We are working together with the Ulster Architectural Heritage to secure a sustainable future for the building. We hope that it will continue to play an important public role in the cultural and historical life of Belfast.” While the UAHS have cosmetically and functionally improved two rooms in the building through renewed paintwork and flooring, underlying issues are prevailing such as end of life electrics, the direct penetration of water ingress from windows which are no longer water tight, together with some structural movement in the back return and the inevitable plumbing and heating issues. However, by occupying the building through a ‘meanwhile use’ the extent of repair needed can be assessed while also enabling consideration of how the building could best be used in the future. Within a few steps of the Old Museum Building sits a third building at risk. No. 12 College Square North forms the end of one of the grandest four-storey former townhouse terraces of early 19th Century Belfast which was home to many impressive figures including Dr. Forsythe (the first of a number of medical professionals to reside at the fashionable address), Dr. William Whitla JP (Professor of Materia Medica at Queen’s College), Samuel Fenton JP (Lord Mayor of Belfast) and Bernard Hughes JP (proprietor of the ‘Railway and Model Bakeries’). While No.s 8-11 have been reused as apartments. No. 12 now sits sadly vacant and empty, and prey to repeated vandalism attacks and forced entry. As a square that has witnessed and experienced many attacks over the years, the fact that these buildings still stand impressive, though albeit at risk, speaks volumes. However, the changing fortunes of the area coupled with the continuous threat of over-development in central Belfast remain issues of concern. The future of this fine remnant of Georgian Belfast needs a conservation led approach to sustain the classic architectural merits of College Square North.